Parts of Alberta and Saskatchewan have a connection to Napoleon that cannot be claimed by anywhere else in Canada: they were once under Napoleon’s rule. In 1803, short of funds for a planned invasion of England, Napoleon Bonaparte sold Louisiana – France’s territory in mainland North America – to the United States for $15 million. James Monroe (who appears in Napoleon in America) negotiated the purchase. When Napoleon was advised of the vagueness of the text, he replied “that if an obscurity did not already exist it would perhaps be good policy to put one there.” (2) He wanted a quick deal, and didn’t mind if the treaty led to conflict between the United States and its neighbours. Everyone generally agreed that the territory was bordered on the south by the Gulf of Mexico and on the east by the Mississippi River (including New Orleans). The western border with Spain was much disputed. It was eventually fixed as the Sabine River in the Adams-Onís Treaty of 1819. As for the northern boundary with British North America, that was unclear. France had given up its claims to the area drained by Hudson Bay (Rupert’s Land, nominally owned by the Hudson’s Bay Company) in the 1713 Treaty of Utrecht, though the exact extent of the Hudson Bay land was not defined. When France ceded its colony of Canada to Britain in the Treaty of Paris (1763), the boundary between the Hudson Bay territory and Louisiana remained unspecified. This is where Alberta and Saskatchewan come in. While most of the rivers and creeks in the southern part of these provinces flow toward Hudson Bay, some – the Milk River in Alberta and the Poplar River and Big Muddy Creek in Saskatchewan – flow south through the Missouri and Mississippi Rivers to the Gulf of Mexico. The lands drained by these tributaries could thus be regarded as having been part of the Louisiana Purchase. 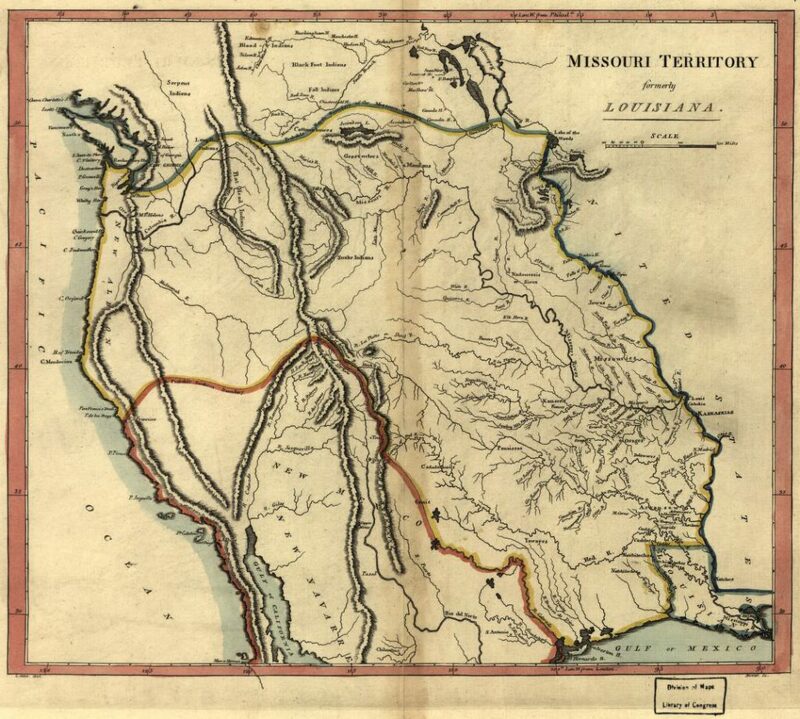 This can be seen on this 1814 map, which depicts the “Missouri Territory Formerly Louisiana.” In 1812, the state of Louisiana was carved out of the Louisiana Purchase area, and the remaining lands were called the Missouri Territory. The area below the “probable north boundary of the Missouri Territory” encompasses the land around the Missouri River tributaries, including the Milk River and Big Muddy Creek (Martha’s River). The “probable north boundary” soon changed. 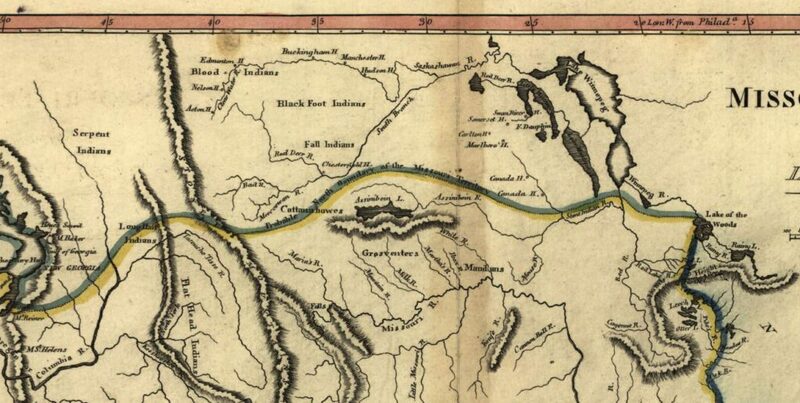 In the Convention of 1818, Britain and the United States established that the 49th parallel would separate Canada and its southern neighbour from the Lake of the Woods westward to the Stony (Rocky) Mountains – something that the two sides’ negotiators had agreed on in 1807. As for how long parts of present-day Alberta and Saskatchewan were – at least in theory – under Napoleonic rule, the answer is not long. Although France had secretly acquired Louisiana from Spain in 1800, Spain continued to administer the territory. To effect the transfer of the Louisiana Purchase to the United States, France took control of Louisiana on November 30, 1803. 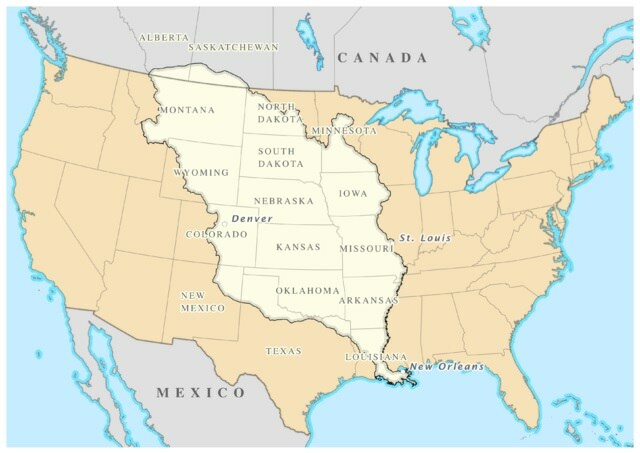 The French handed Louisiana over to the Americans just three weeks later, on December 20, 1803. If you wonder what might have happened if Napoleon had tried to play a greater role in ruling parts of North America, read Napoleon in America. Louis Houck, The Boundaries of the Louisiana Purchase: A Historical Study (St. Louis, 1901), p. 5. François Barbé-Marbois, The History of Louisiana: Particularly of the Cession of that Colony to the United States of America (Philadelphia, 1830), p. 286. James Alexander Robinson, Louisiana Under the Rule of Spain, France and the United States, 1785-1807, Vol. 2 (Cleveland, 1911), p. 141. The History of Louisiana: Particularly of the Cession of that Colony to the United States of America, p. 290. Thomas Jefferson Randolph, Memoirs, Correspondence, and Private Papers of Thomas Jefferson, Vol. III (London, 1829), p. 518. Paul Leicester Ford, The Works of Thomas Jefferson, Vol. X (New York and London, 1905), p. 180. Thanks Shannon. Looking back today is seems rather strange that no one involved in the sale considered there were humans living on this land. They had been there making their living from it for thousands of years; if anyone had a MORAL claim to the land, they did. They were the natural owners. Nonetheless, I am glad US and UK did not go to war with one another later over that little patch that fell into Canada. Sanity for once. I agree, Addison. Talleyrand’s comment about the territory containing “only” Native Americans was quite reflective of the prevailing attitude. Since that part of America is without European settlements and encloses only uninhabited forests or Indian tribes, the necessity of marking a line of demarcation has been less felt there. Neither has a line been drawn between Louisiana and Canada.